I was 5 when I first saw the ocean. It was in Gloucester, Massachusetts, where our good friends, the Marie family, rented a vacation home. If memory serves me right, just before dinner the lobsters escaped their briney pail and went for a short excursion in the kitchen—a typical Marie family escapade. 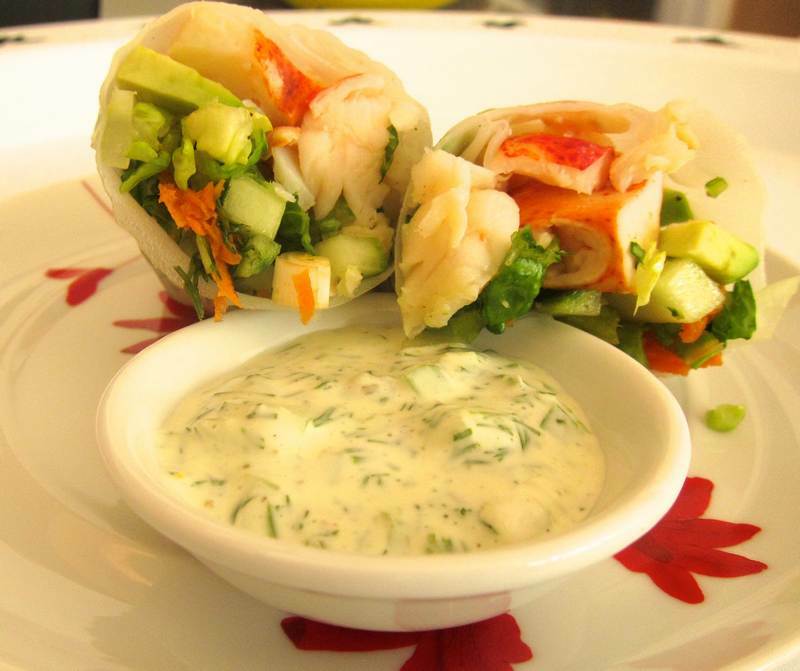 The talented Mom, Evelyne Marie, went on to write A Crime Story—and I’ve transformed the memory into Lobster Wrap with Lemon Mayo Dill. 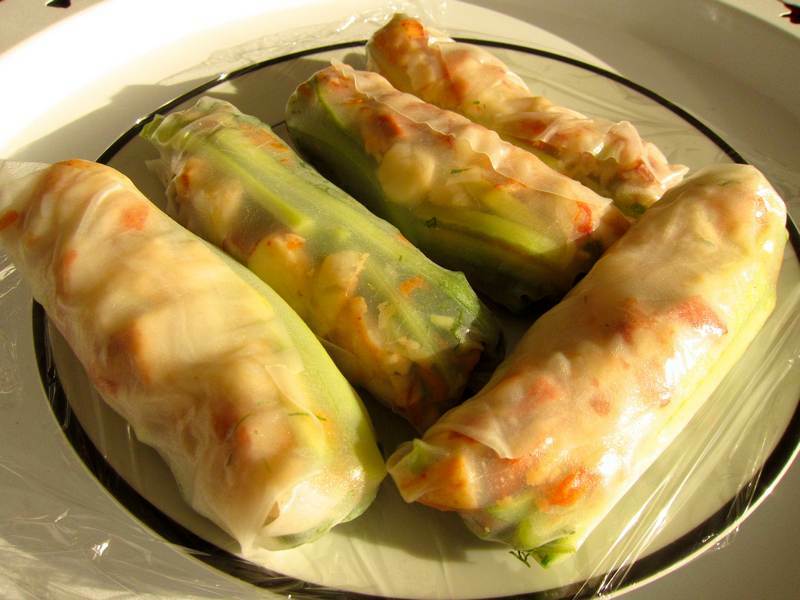 Fill a shallow dish with lukewarm water and soak rice paper wrappers, one at a time, until pliable, 15 to 20 seconds. Transfer to dish towel laid out on a cutting board. Change the water every few minutes so that it remains lukewarm. Place 3 tablespoons of lobster and small amounts of each other ingredient on the lower third of the rice wrapper closest to you. Sprinkle lightly with Herbamare. 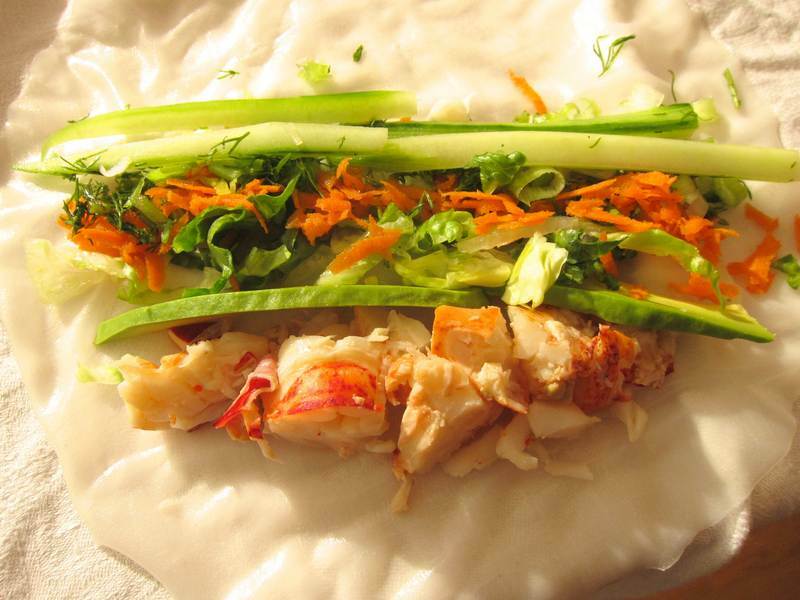 Begin to roll rice paper wrapper away from you, then fold sides in and continue rolling tightly. If not serving immediately, fold the rolls in a damp dish towel, making sure they aren’t touching or they will tear, then refrigerate them in a sealed plastic bag. Just prior to serving, cut each roll in half and serve with Lemon Dill Mayo. Makes 8 good sized wraps for 4-8 servings. In a medium-sized bowl, mix all ingredients, then refrigerate for at least 10 minutes before serving to allow flavours to blend. Serve in individual bowls to allow for double dipping. Watch this video on how to manage rice paper wrappers. These wraps are super versatile. Instead of lobster you can use chicken, shrimp or fish. Maybe you find wraps too fiddly or your rolls flopped. 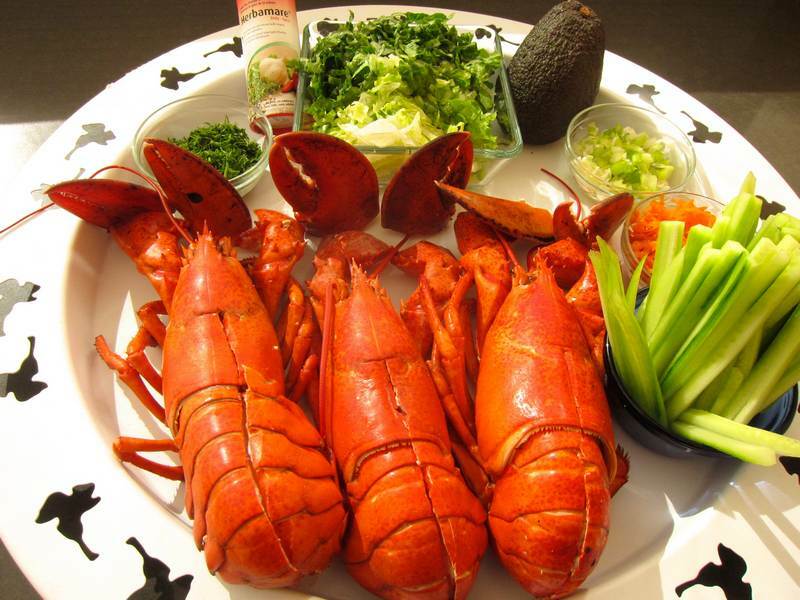 If so, you can use all the same ingredients to make a wonderful lobster salad with Lemon Dill Mayo as dressing. Beyond delish! Lemon Dill Mayo is excellent for dressing up vegetables, fish or a grain dish. Don’t forget to read A Crime Story. Evelyne is counting on Jittery Cook to make her famous. Thanks Jovina. Am proud of conjuring this one up with some tiny tweaks from my sister. I knew you’d love this! It is a definite possibility for a birthday celebration. I’ll enlist some sous chefs. Holly, you were only about 5 years old. The whole trip down you were car sick…. clutching a pillow and moaning, “my tummy is hot”, over and over. Good thing I have you as my memory repository! I did think I was much younger as the tide seemed to stretch out low, low, low for miles. lobster. food of the gods. this looks unbelievable, just too delicious!!!!!! Makes me long for the ocean. Next weekend I’ll have my chance for a dip. Oh, this looks good. I seem to be the only one in my family who likes lobster. Maybe this will sway them. I’m sure you could persuade a couple of friends! Thanks for liking Sonia!